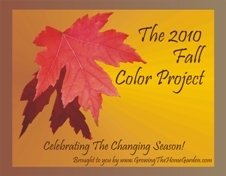 Dave at The Home Garden has a great project going: bloggers post pictures of autumn in their area, send him the link, and he posts them so people can see autumn all around the country - even the world! (northern hemisphere, anyway!) I think Southeastern Pennsylvania can hold its head high when it comes to autumn color. These pictures are from a couple weeks ago, before the peak - I've seen amazing views since, but I've been driving! Ah well, there's always next year! These shots are all around Lake Nockamixon. This is what I caught with my dinky little one-step, so imagine how much better it was in real life! And finally, a neighbor's beautiful barn framed in shades of red and gold! I hope this wasn't too long! I enjoyed it so much that I am going to do another, with close-ups on the beautiful flowers autumn is still giving me in my gardens. (Kathy at Cold Climate Gardening just did this, and it was lovely!) It is a bittersweet season, since it ends in gray and cold, unlike spring which ends in green and warmth. But this project has helped me focus more on what this beautiful season offers than what it does not. Happy Autumn! Just a little note to encourage people to check out my oldest daughter's blog! She is spending the semester in Rome, and has been posting some neat things. She is artistic and philosophical, and has a terrific writing style. Check out what she has to say about Rome, scorpions, and life at her blog, Art, Truth, Crime, and Me. We recently watched the absolutely beautiful and moving film, Captains Courageous, made in 1937 (Spencer Tracy got an Oscar). That was one spoiled boy in that movie! Good hard work is what turned him around, and the satisfaction of a job well done. This, too, is something that I want to teach my children. Not only will they experience awe and wonder at the beautiful world, but grow in maturity as well. We can learn great lessons from the soil. We have begun the renovation of the front of the house! I have struggled with this garden for twenty years. Pestered by a truly pernicious grass infestation, soil that is not acid enough for the azaleas and rhododendrons I planted years ago, old and broken concrete and an unattractive porch, and the fact that it does not point quite due east, so one side gets full sun and the other shade, has made this a most challenging garden. Not to mention the voles! Ugh! I hope I am not setting myself up for more disappointment, but I am trying again. This time I think I’ve learned enough over the years to get it right. I finally gave up on the garden on the hill this spring, pulling up all the plants that gave the voles cover and a 24-hour buffet. I have determined to put edging between the garden and the grass, to slow down its approach. Since I am overwhelmed with the lovely but excessively eager lamb’s ear in a different bed, I am transplanting some to either side of the steps down to the mailbox, and on the sides of the porch. I certainly won’t have to worry about weeds when that fills in! Which will be by next year! I’m tearing out the azalea that are so sick they are growing lichen. Boo hoo, they are so pretty when they bloom, but the rest of the year they look pretty terrible. I’m going to give the rhodies a little more time to prove themselves, since they’re not as bad. The monster-plant I will chop nearly to the ground! If it dies, I won’t mourn it, but I don’t think I will have such luck. Next year, as it comes back cheerfully (some might say spitefully) I will try to shape it to my will! And I have chosen some evergreen bushes of various shapes, daffodil bulbs (voles don’t like them) and several perennial flowers to fill in the front. It’ll be a good start. Over the winter I’ll evaluate for color in the different seasons, but at least it will be attractive during the winter. I want only no-fuss plants out front, since I never go out there and usually forget about it. I’ll keep you posted, and I hope it gives you some good ideas about your own garden! The autumn garden is still providing lots of bouquets – smaller, perhaps, and every week there are fewer varieties, but one can still find plenty of blossoms. But, ask yourself, how do the gardens look? Vibrant and colorful, or sad and struggling? Well, I admit, most of mine are the latter. So, now is the best time to evaluate! Then we’ll have winter to research, and spring to plant. Here’s what I’m doing. First, I’m taking pictures of every garden. I already have garden maps, laid out on grid paper (which are particularly handy when I need to remember where I put dormant bulbs! ), which will help me as I plan, but if you do not, now’s the time, before the plants disappear. I am also looking at gardens as I drive around. What looks good? What doesn’t? Not surprisingly, few people have particularly nice gardens. Most people just stuff some newly-purchased mums in a row like soldiers, and think that looks nice. Well, better than weeds, but I prefer a more natural look. Some people have nice BIG mums, which grew throughout the summer and are cascading onto the lawn and walk. Now THAT looks cool! (Nonetheless, mums should be cut back in the summer to control their growth and delay blooming until fall.) Some annuals still look nice, as well – impatiens, marigolds, alyssum… but few people have taken the time to really design beautiful autumn gardens. That’s what I hope to create. So, now I am beginning the research, which will continue into the winter. Some bushes I intend to remove this fall, and some I decided on over the summer will be put in. I WILL make the front of the house look nice this fall! But most of my new garden decisions will take place over the gray winter months, bringing color into my heart during a generally drab season. But for now, I still have flowers to play with! (Click on the pictures to see them larger.) These are the bouquets I made with today’s collection: with one I went with a cool color theme, and with the other I used warm shades. I am of the philosophy that, like a story or a poem, a bouquet should have a plan and purpose, but also an unexpected element. In the cool bouquet, I have added touches of red to create spark, and sprigs of the silver foliage of lavender. For the warm bouquet, several old sunflower seed heads add an unexpected twist. Flower arranging is so much fun! Before all your edible flowers have died for the season, make this elegant omelet! This recipe appears in Kathy Brown’s exquisite book, The Edible Flower Garden. Slice the beans in fine long strips and parboil four minutes. Drain. Beat eggs with milk, crush the seeds with a fork until they are broken into pieces and add with the leaves and petals to the egg. Melt the butter in the pan, and when ready add the egg mixture and beans. When omelet sets, sprinkle with parmesan, fold, and serve with nasturtium garnish. My variation: I used tiny hyacinth beans and their buds rather than scarlet beans, and I didn't par-boil. I thought the flowers would burn if they were added to the mix, so I laid the flowers and leaves on top of the egg mixture while it set. (Keep in mind that the larger the leaves, the pepperier the flavor! I only used nickel-sized leaves.) I like to flip my omelet so no egg is uncooked, so I quickly flipped when fully set, sprinkled with parmesan, folded and removed. I was not quite ready with the parmesan, so I could have flipped faster to retain more color, but it came out looking lovely and tasting great! Enjoy the end of your summer flowers! Hello, friends! Just wanted to post a quick note to let you all know that today is my husband and my anniversary! Twenty-two years of wedded bliss (most of the time!) and six wonderful children (most of the time!) - what more can one ask for except more of the same? (yes, even more children, but we're too old now!) We have a roof over our heads, food in our bellies, clothes on our backs, and love in our hearts - and a loving God Who gave His life for us, rose for us, and watches over us with loving care. We are truly blessed, and I will pray tonight that all my readers will also be blessed. Have a wonderful night! Our little pond is a delight, as you can see from this image of my youngest daughter last year. For us it's like a fairy world! One of the best things I've ever done with my gardens. When I began to research water gardening a few years ago, I read and referenced many library books. This exhaustive work helped me understand the many aspects of water gardening: the different kinds of gardens, how to create them, and the work involved in maintaining them. My research also helped me determine what kinds of plants I wanted and the potential pests that can create problems. I went through many different books to find this information, but few covered all these aspects, let alone in a concise and engaging manner. I wanted to find a single resource that would be both thorough and beautiful, and I searched both bookstores and online to find one. Then I discovered The Practical Rock and Water Garden, and I knew I’d found a treasure. I ordered it immediately, and it has become one of my favorite resources, not only because of its wealth of information, but for its inspiring photography. This book by Peter Robinson really has it all. After a brief introduction, Robinson helps the reader choose his or her own style through the use of exquisite photos and informative explanations. He even lists the plants used in the pictures for each style! Garden styles include natural pools and raised pools, shade pools and bog gardens, even gravel gardens and dry river beds, and a wide variety of water features, from bubbling pots to full-size falls. He next shows examples of various extras, like bridges, islands, decks and more, explaining how best to incorporate them. Then comes the real meat: how to actually design and construct every conceivable water or rock garden. With the many step-by-step photos and clear information Robinson provided us, we were able to choose, design, and construct a beautiful water garden that has captivated not only our family, but visitors and neighbors as well. The book finishes with an exhaustive plant directory, fish information, and a thorough care and maintenance chapter. Everyone enjoys our water feature, and there have been so many benefits to adding the pond to our property: the wildlife that the children are able to experience up close, the soothing sound of the waterfall as we sit on the patio, the variety that it adds to our landscape and more. If you have a water garden, or are thinking about adding one (and I hope you do!) this is the best book to guide you through this terrific addition to your gardens.